The turquoise water of the Gulf of Thailand is home to the incredible Southern Islands of Cambodia, famous for white sandy beaches, adventurous inland jungles and the nocturnal magic of sparkling bioluminescent plankton. Untouched by modern development, the islands are full of pretty villages and isolated coves – perfect for a laid back holiday. Island hopping is often highly recommended by holidaymakers in Cambodia, so we’ve taken a look at five of the best to help you narrow down your travel itinerary. The highlight of the islands is the wide, sheltered Saracen Bay where travellers can stay in any number of unassuming resorts that hug the shoreline. For more seclusion, you might head for the island’s western shores where the island’s oldest resort, Lazy Beach, is a veritable hideaway complete with hammocks and sunset cocktails. More adventurous travellers make a beeline for M’Pai Bay on the island’s northern tip, where a cluster of low cost inns accommodate those looking for the local vibe of this friendly fishing village. While Koh Touch village is a renowned party destination, the rest of island is a haven for solitude and relaxation. The aptly named Long Beach is the real island highlight, weaving its way for a good 7 kilometres along the island’s western shores. You can take boat trips to Long Beach and enjoy the soft sand between your toes, along with swimming and fishing. Boats also convey you by night to swim among the glittering bioluminescent plankton that grace the waters and light up when you move your hands and feet. Flanked by mangrove forests, the almost uninhabited island of Koh Thmei sits on the edge of Ream National Park. Here you will find an intimate, eco-resort sitting on the shoreline – the perfect option if you prefer to be at one with nature instead of mingling with the crowds on some of the other islands. Exotic shells, a coral reef and excellent snorkelling all await you while inland, the jungle is home to over a hundred different species of birds. 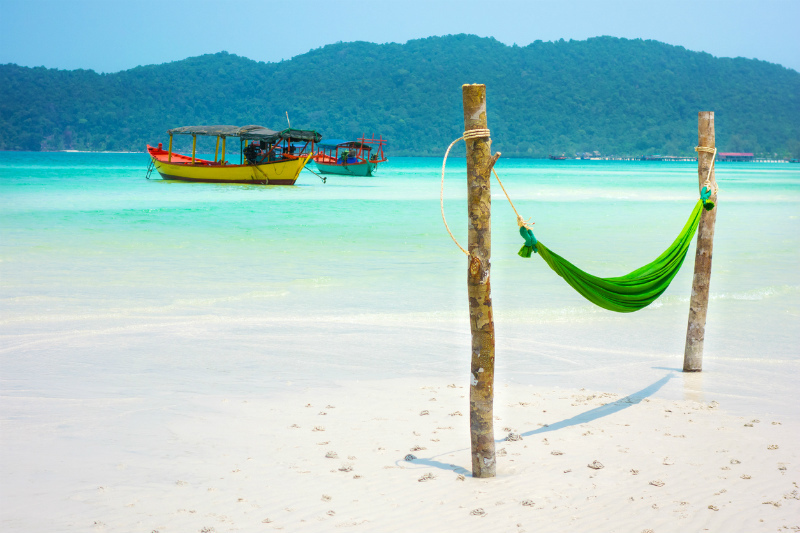 Koh Ta Kiev is your chance to experience the beach-bum lifestyle. Here you’ll find a handful of budget resorts straddling the southwest and west coasts, and there’s ample opportunity to sleep in hammocks or under canvas if there’s no room in the beachside dorm or huts. The white sandy beach is ideal for chilling out. When you’re ready for a little exploration, follow the various tracks leading through the forest and onwards to a more secluded beach on the south coast. 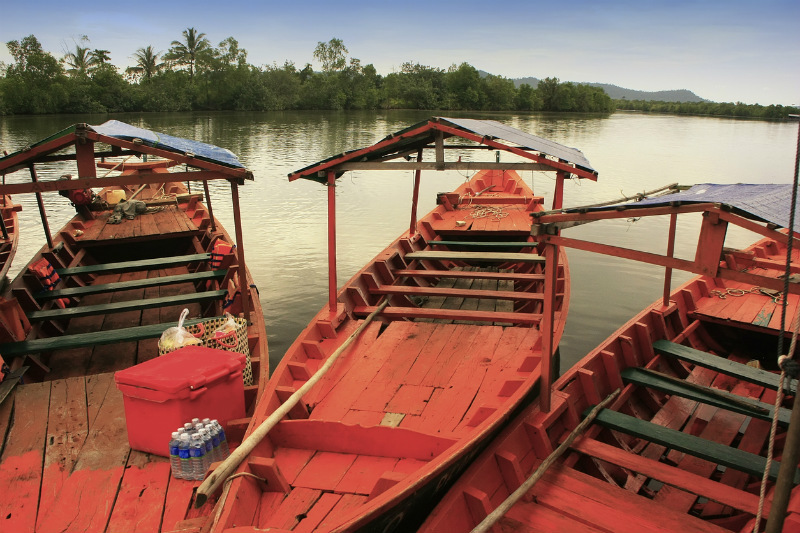 Koh Totang in the Koh Sdach archipelago is castaway chic with proper eco credentials. The island’s only resort, Nomads Land sits in superb isolation and prides itself on sustainable resources. Solar power provides the electricity; drinking water comes from stored rainwater; and bathrooms have bucket showers and composting toilets. The five quirky, colourful bungalows are a beachcomber’s dream, while hammocks and cosy corners for chilling out are plentiful. This is the epitome of stylish eco-living.